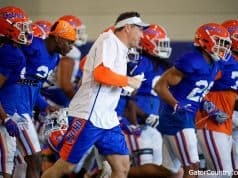 The Florida Gators hosted its annual Orange and Blue spring game on Saturday as the Gators wrap up spring football. 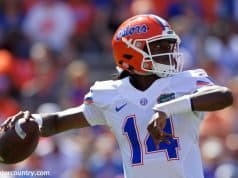 The game started with a little trickery as Kadarius Toney hit Feleipe Franks for a long pass on a reverse as the offense had a good game as expected in a spring game. Quarterback Feleipe Franks had a big day on offense as he accounted for much of the offense for the Orange team. 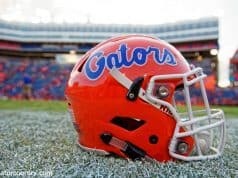 Orange 7, Blue 0- 14-yard touchdown pass from Feleipe Franks to Kadarius Toney with 12:06 to go. Orange 14, Blue 0- 80-yard interception returned for a touchdown by John Huggins. Orange 14, Blue 7- 9-yard touchdown pass from Emory Jones to Tyrie Cleveland with 4:40 to go. 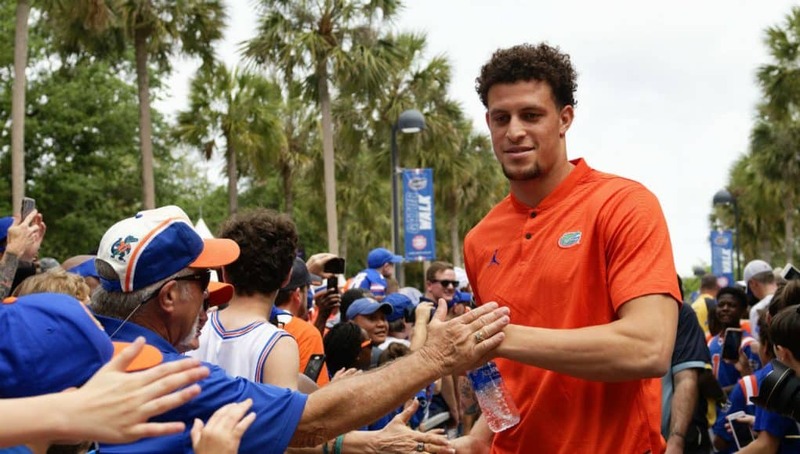 Orange 21, Blue 7- 65-yard touchdown pass from Feleipe Franks to Trevon Grimes with 4:26 to go. Orange 21, Blue 14- 29-touchdown pass from Kyle Trask to Freddie Swain with 1:21 to go. Orange 28, Blue 14- 8-yard touchdown pass from Feleipe Franks to Van Jefferson with 14:42 to go. Orange 35, Blue 14- 61-yard touchdown pass from Feleipe Franks to Trevon Grimes with 11:30 to go. Orange 35, Blue 21- 54-yard touchdown pass from Feleipe Franks to Freddie Swain with 10:17 to go. Orange 35, Blue 28- interception return for a touchdown by Lito Sheppard with 10:07 to go. Orange 42, Blue 28- 1-yard rushing touchdown by Feleipe Franks with 8:52 to go. Orange 45, Blue 28- 42-yard field goal is good by Chris Howard with 0:00 to go. Orange 51- Blue 28- Chris Doering with a touchdown catch. Orange 51- Blue 35- 35-yard touchdown pass from Emory Jones to Tyrie Cleveland with 1:06 to go. Orange 60, Blue 35- 4-yard rushing touchdown by Jalon Jones with 5:20 to go.